Non-alcoholic fatty liver disease (NAFLD) refers to a spectrum of hepatic lipid disorders characterized by hepatic steatosis with no known secondary cause (1). It is subcategorized into (a) nonalcoholic fatty liver (NAFL), defined as the presence of of steatosis in the absence of histological evidence of hepatocellular injury, and (b) nonalcoholic steatohepatitis (NASH), hepatic steatosis accompanied by hepatocyte injury and inflammation; NASH may occur with or without fibrosis, but may progress to fibrosis and cirrhosis. NAFLD is generally associated with energy metabolism pathologies, including obesity, dyslipidemia, diabetes and metabolic syndrome. The prevalence of NAFLD is high. Prevalence in the general population is estimated at 20%, with prevalence of NASH estimated to be 3-5% (1,2) Patients with obesity or diabetes demonstrate ~70% prevalence of NAFLD, and those with dyslipidemias are estimated to have a prevalence of ~50%. These therapeutic combinations are presently in clinical development. The global prevalence of obesity has doubled over the past three decades; the obesity epidemic now represents a significant public health risk in the US and other developed countries as well as in the developing world. In the US, >35% of the adult population and 17% of the pediatric and adolescent populations are obese, and ~70% of the population is overweight or obese. Obesity results in a 5-13 year reduction in lifespan and there are more than 300,000 obesity-related deaths annually in the US. Further, obesity increases the risk of co-morbidities, including cardiovascular disease, type 2 diabetes, hypertension, dyslipidemia, obstructive sleep apnea, and some cancers. However, weight loss of just 5-10% reduces the risk and severity of these co-morbidities. 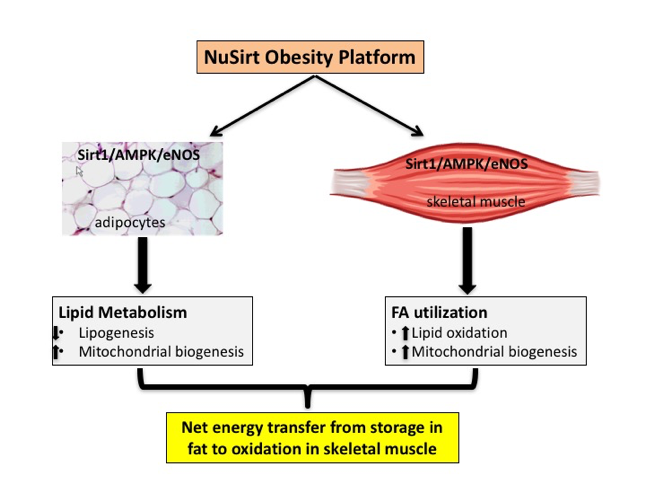 NuSirt has demonstrated that combining L-leucine with established therapeutic agents results in a shift in energy disposition from storage in adipose tissue to oxidation in skeletal muscle and significant decreases in body weight and fat, waist circumference and obesity co-morbidities, and is now developing these combinations as therapeutic modalities. In 2012, the American Diabetes Association and the European Association for the Study of Diabetes jointly published a position statement on management of hyperglycemia. In this publication, metformin is listed as the first line drug of choice for newly diagnosed people with diabetes who cannot control their glucose with diet and exercise alone. Reports suggest that metformin is the most frequently prescribed medicine for diabetes. While metformin is considered a relatively safe medicine, use of metformin alone to treat T2DM has several drawbacks, including GI side effects that reduce compliance and/or lead to drug discontinuation. It is estimated that between 25-50% of patients who take metformin experience nausea, vomiting and/or diarrhea and these adverse events are dose related. In addition, metformin does not address other health risk factors common to diabetes, most notably the elevated inflammatory stress that contributes to cardiovascular risk in diabetics. Therefore, there remains a significant unmet therapeutic need to address drug efficacy, diabetes-related cardiovascular risk, and side effects. 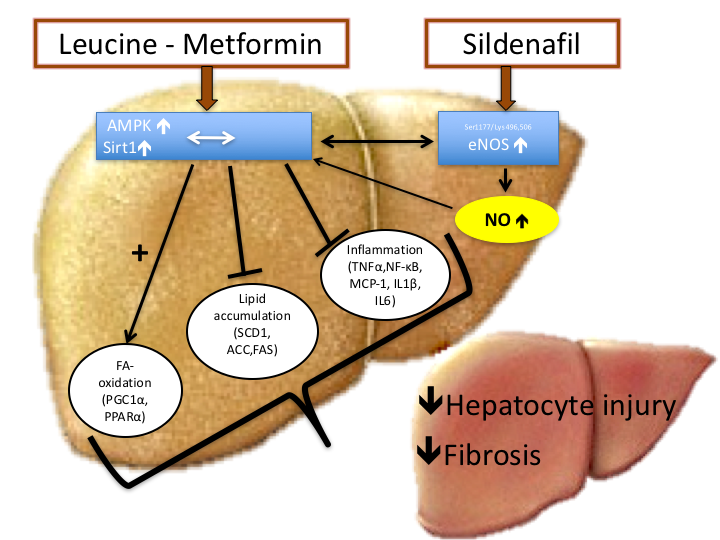 NuSirt has demonstrated that L-leucine converges on the same signaling pathway (AMPK-Sirt1) activated by metformin to increase insulin sensitivity; accordingly, the company developed a product concept employing a proprietary combination of L-Leucine with significantly lower doses of metformin to achieve glucose control equivalent to the customarily used higher metformin doses. Based on results from discovery and pre-clinical studies, NuSirt has developed a combination product intended for human use. This product consists of a fixed dose combination of leucine and metformin with a goal to augment metformin efficacy and produce equivalent glucose control to customarily used higher does of metformin in patients with Type 2 diabetes. A Phase 2A clinical trial of this concept has been completed with results presented at the ADA 76th Annual Scientific Sessions, June 12, 2016. NuSirt has clinical data demonstrating significant progress in the areas of hypertension and dyslipidemia.